Edinburgh Adventure Activity Packages. 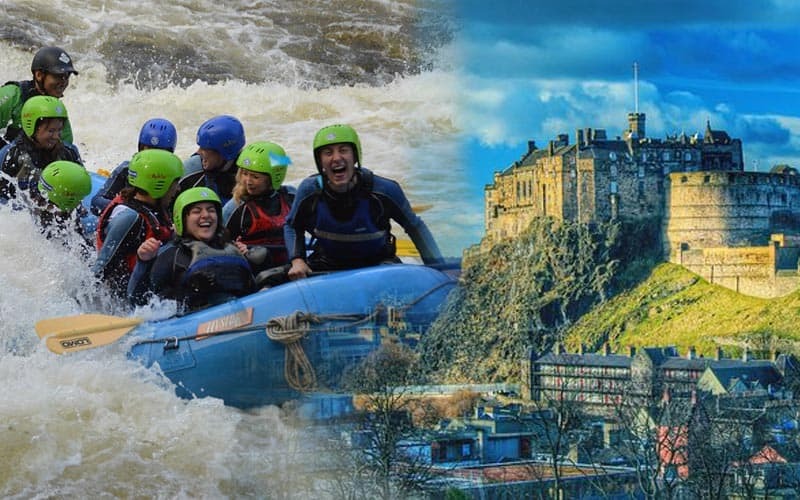 Splash White Water Rafting has teamed up with a range of accommodation and transport providers in Edinburgh to allow our customers to have the best of both worlds. The excellent night life available in Edinburgh and the best adventure days available in Scotland at the best price. As you are dealing directly with Splash the activity provider we will be able to provide you with the best and most accurate information for your Edinburgh adventure weekend. Edinburgh, is, without, doubt, one of the Worlds great cities and is a must-see destination. It hosts the largest arts festival in the World each August and leaves a lasting impression on all who visit this historic city. The range of visitor attractions is huge. Edinburgh Castle is a big favourite as is the Whisky Experience on the Royal Mile. Edinburgh has an excellent airport which is connected to the city by a tram. Also, Edinburgh has two railways stations in the city centre, as well as many park and ride bus parks on the outskirts of the city, so guest has a choice on how to travel. Our Edinburgh Adventure Activity packages is the perfect package for a couples weekend break, a birthday treat, or for a Stag or Hen party. No matter the numbers we can help. Rafting and Quad bikes For an action packed 2 days you can select 3 or 4 of the above Take your pick from any of the half-day activities or full days on the river to make the perfect day for your group (age restrictions apply).